Friday at Burghley dawned dry and clear and not too warm for our course walk with Nick Turner FBHS. This time it actually was a walk and not a march as Nick’s riders had all done their dressage on the Thursday! 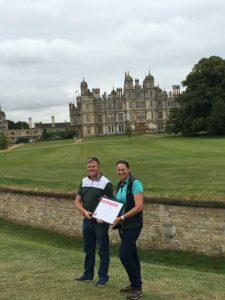 Nick presented Katie Partrick with her BHSI certificate with Burghley house in the background so welcome to Katie, well done for all your hard work. The technical combinations came thick and fast with some looking almost impossible with the lines that needed to be held. You needed a fit horse not only physically but mentally as well. We had an insight into the frangible pins and their value including the 11 penalty clause (which was used on Saturday). The mimms clip is also used by BE and FEI but none were used at Burghley. Thankyou as always to Nick for sharing his views and immense knowledge, with everyone able to ask any questions they wanted.